Chair makeover inspiration anyone? These are 16 of the most inspired, creative and innovative projects I’ve come across online. I’ve restored a chair or 3 in my past. I’m about to embark on a new chair restoration project and was looking for some inspiration. I learnt that reupholstering is only one of the many (and probably the most painful) ways to restore a chair. And that all chairs can be repurposed, no matter what the condition. I just couldn’t keep these ideas to myself and had to share them. I’ve grouped the projects together for their noteworthy traits. I mean it. I think broken chairs left out for council pickups are going to become hot property after you see what can be done with them. Sparkles of Sunshine (Pic 1) turned her’s into a pretty and comfortable place for her little dog to rest. 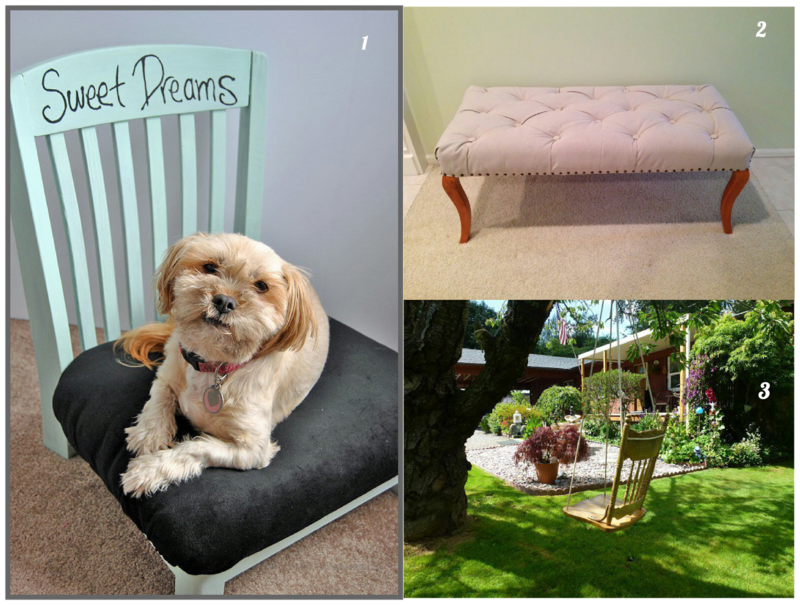 Thrifty Treasures (Pic 2) just repurposed the chair legs in her project and made an awesome ottoman. Lastly, in Pic 3, why have legs when you can fly through the air – cut off the broken legs on this chair to transform it into a swing hanging from a tree. I could totally do this on the jacaranda in the front yard. Teri, the creator of this piece, doesn’t have a website but I found it here. You know how you have maps and ticket stubs from all the cities and places you visit on holiday? When you come back home you don’t have the heart to throw them out and they just take up space. 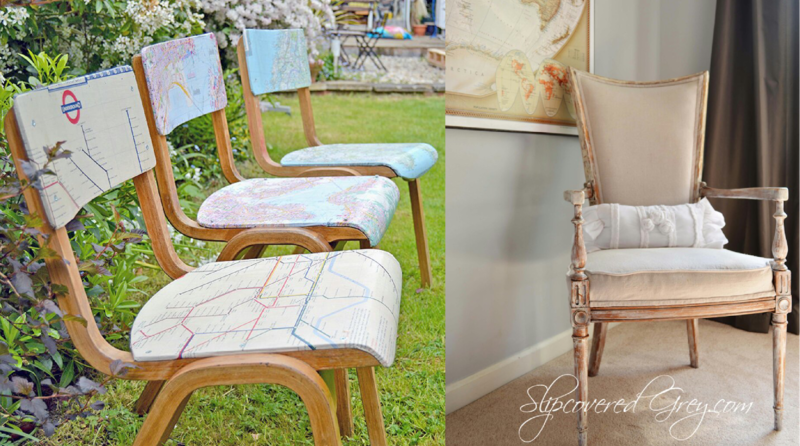 Pillar Box Blue (Pic 1) decoupaged some wooden kitchen chairs with maps of places she had visited. Cleverly meaningful and a great talking point. Having reupholstered chairs myself, I totally appreciate what Slip Covered Grey (Pic 2) has done here. You can’t tell from the picture, but she has written the story of how the chair came to be in the family on the backing beneath the upholstery, leaving a wonderful surprise for the next person who restores the chair. These projects had me staring at the screen in delight and marveling at the amount of creativity there is out there. 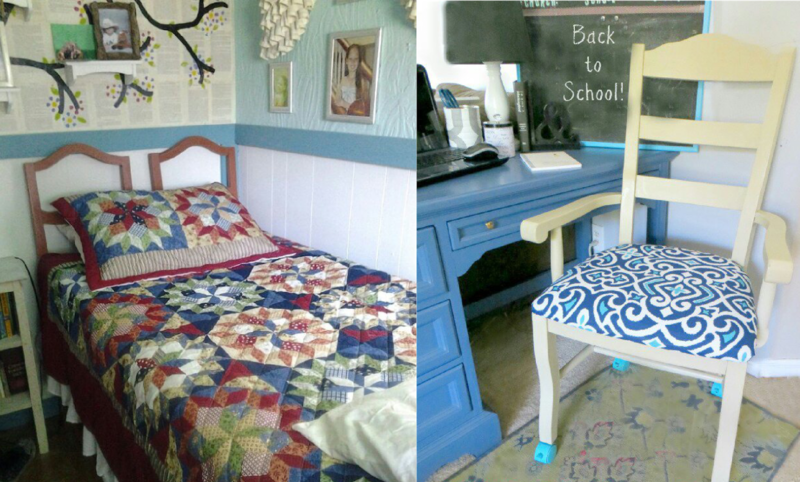 Shawn D (Pic 1) turned four kitchen chairs into a bed! And it looks so simple. Hello Life Online (Pic 2) turned a simple dining chair into a pretty awesome desk chair by just adding castors. Such little twists with such great outcomes. I get carried away by colour and I admit I may go a little too far sometimes. The lesson I learnt from these three projects is that I need to be a little more restrained in future. Dwell Beautiful (Pic 1) uses the gold accents…well beautifully. The chair would not be as lovely if it had been gold all over. Tasha, from a Designer Trapped in a Lawyer’s Body (Pic 2), fell in love with a chair but couldn’t afford the hefty price tag. She sourced the fabric and decoupaged a wooden chair with it. The fabric design is lovely but can be overwhelming in large pieces. I think the project Tasha choose was just the right size to showcase the fabric beautifully. I stayed away from these types of chairs as I think they are old fashioned. Freshcrush (Pic 3) however, uses the two different fabrics and paint in her wingback chair very cleverly. The effect is modern and fresh and I so want one now! I never believed in painting furniture but these projects have me itching to try my hand at painting the chairs at home. 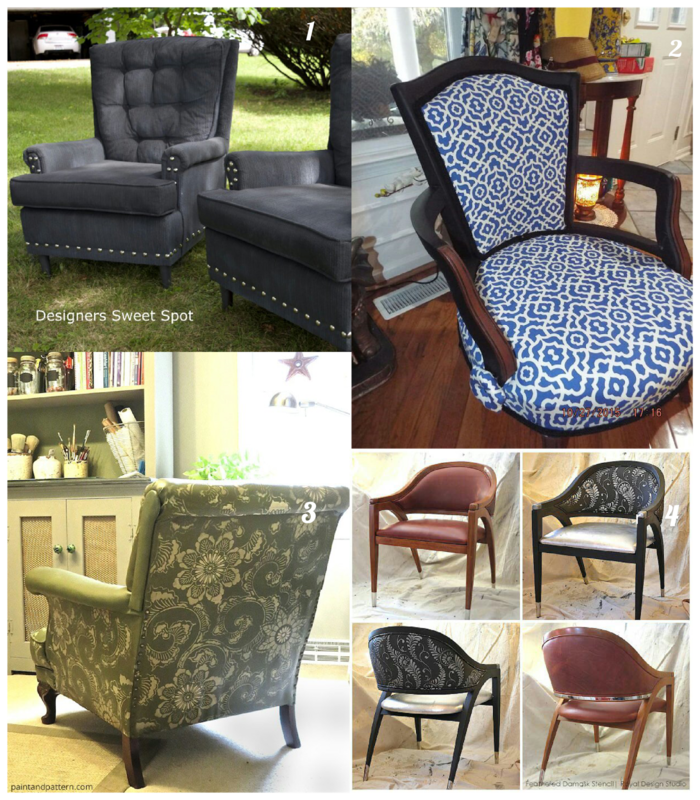 Designers Sweet Spot (Pic 1) spray painted velvet armchairs and added metal trim to completely transform her old chairs. Franny (Pic 2) chose to paint the wooden parts of her chair that must have been covered by fabric previously and retain the original stained portions too. I think the combination of stain and paint is just awesome. The next two projects are from Paint and Pattern’s blog. The clubchair (Pic 3) uses a combination of paint and stencils while the stenciled chair project (Pic 4) uses paint, stencils and silver foil. The next two projects are just genius in their simplicity. 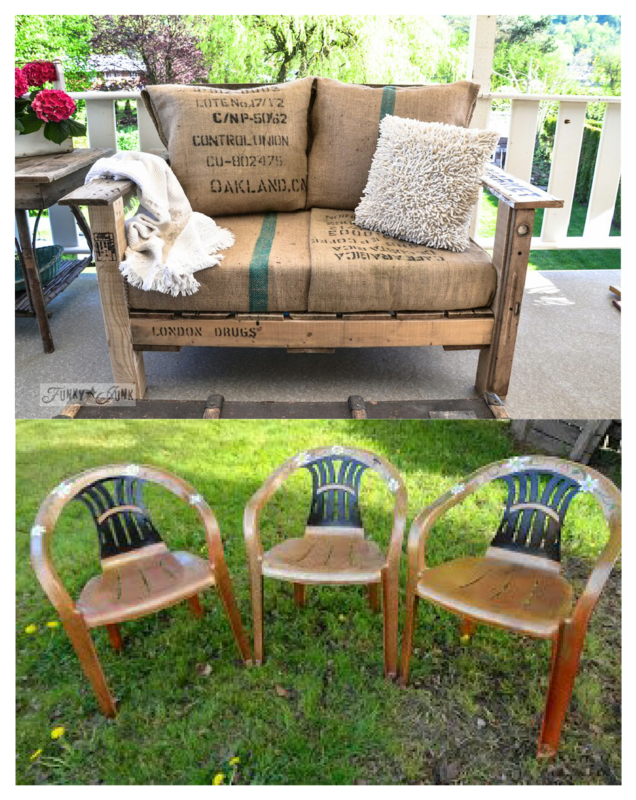 Pallet furniture is the craze right now and Funky Junk Interiors (top picture) made a beautiful sofa using 2 pallets. Simple to make too! Cheries Forget Me Nots transforms the ubiquitous white plastic outdoor chair into pretty furniture. 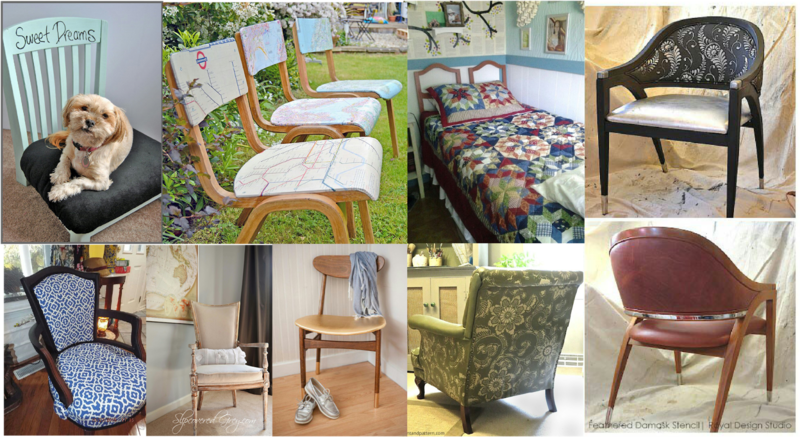 Would you believe these started out originally as a stained white chair?